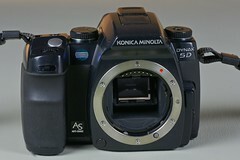 The Konica Minolta Dynax 5D is a Digital SLR camera announced by Konica Minolta on July 15, 2005. 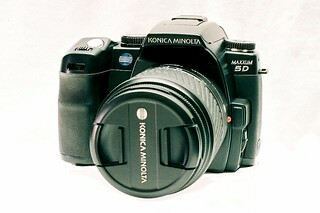 It is also known as Maxxum 5D in the USA and (Alpha) αSweet Digital in Japan. 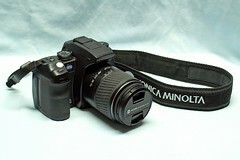 It became available from September 2005 and was bundled with the AF DT Zoom 18-70 mm / f3.5-5.6 (D) lens. 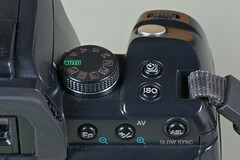 The camera features a 6 megapixel CCD sensor. Image files are created at a maximum resolution of 3008 x 2000 pixels and recorded in JPEG (STD, Fine, EX-fine), RAW and RAW+JPEG formats. 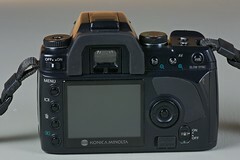 It uses CompactFlash for storage. The back has a 115,000 2.5" TFT color display. This page was last edited on 20 February 2019, at 07:17.